Perhaps it's because everyone has a shadow, that people of all ages are attracted to the ancient art form of "shadow puppetry". 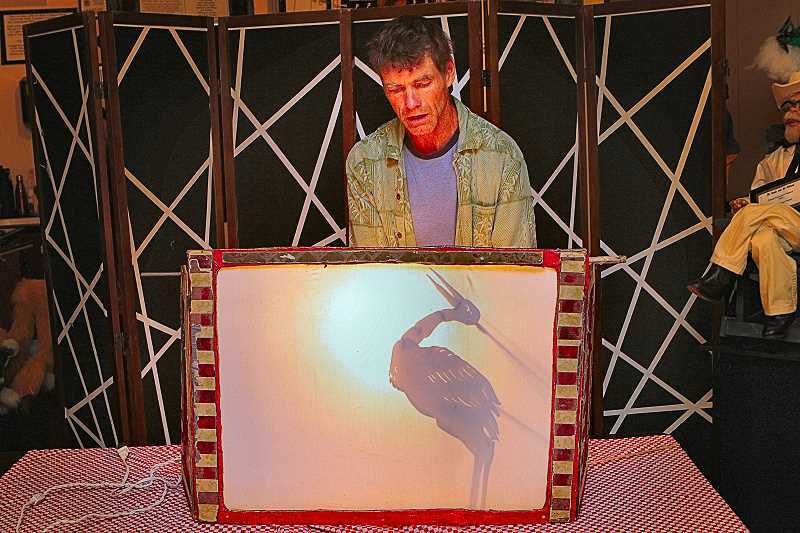 That's what visiting artist Sean Powers said he's surmised about his craft – as a professional full-time shadow puppeteer, while in residence at Sellwood's "Portland Puppet Museum" in early August. Coming from a family of storytellers, Powers told story after story about how shadow puppet shows affect people. For example, Powers recalled that at an outdoor arts festival, he hung a sheet over a rope between trees, lit a camping lamp, and put on an impromptu show for three little girls who asked to see him perform. "After the show, when I came from behind the sheet, there were about 60 people standing there! Everyone from bikers, to teenagers, to old folks – watching in complete silence. It was so quiet, I'd been wondering if the girls had left during the show." In a room with an audience of hundreds of people, the power of shadow puppetry silences them, "except for laughter. I have a lot of visual humor in my shows," Powers said. Hailing from the Sacramento, California, area, Powers told THE BEE that he saw his first shadow puppet show in 1984 at a nearby university, featuring a huge screen behind which a single "dhalang" (master puppeteer) sat, performing all of the parts, while also leading a Javanese gamelan orchestra! "They let people view the show from behind the screen, and I thought it was so cool," Powers grinned. While he took instruction to be an illustrator, Powers said that in the early 1990s, he read how shadow puppetry was disappearing. "How sad, that this art form – that's entertained people for thousands of years – is going to disappear." When he tried out, doing a simple show at a preschool, he was amazed at how even the youngest tykes settled down, and paid close attention for as long as twenty minutes at a time. "It was then I decided that it was my mission, my crusade – to keep alive the art and craft of shadow puppet shows," explained Powers. Although some might say this art form is anachronistic in a digital age, Powers reflected: "It's an art that isn't expensive or complicated; I hold classes, teaching people how to make shadow puppets, so they can share their own stories with their families and friends. Everyone seems captivated by shadows."